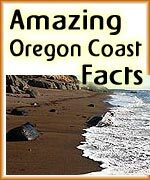 (Oregon Coast) - Long walks on the beach, playing in the sand or bouncing around the many rocky slabs that comprise chunks of this area are the big attraction to the Oregon coast. 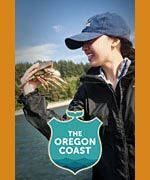 But there’s also crabbing, clamming, hiking, boating, kayaking, whale watching and other activities that make for a complete visit. 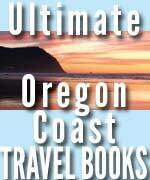 If you've ever needed a quick reference guide to the outdoors for the Oregon coast – this would be it. 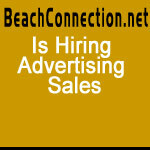 Follow the links to further information and details. 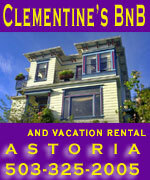 Astoria/Warrenton Area: see the Astoria Virtual Tour and do a search on Astoria/Warrenton articles. 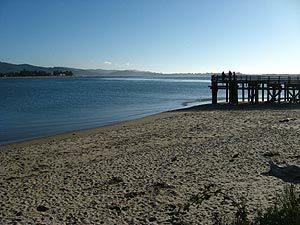 Astoria itself has no beaches as it’s on the mouth of the Columbia. 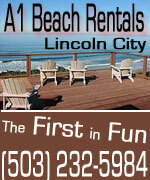 But there are numerous lakes and outdoor attractions here, as well as many riverside beaches. 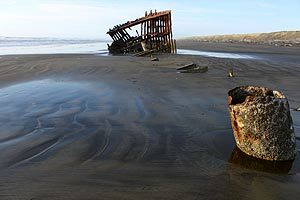 The beach starts at Warrenton, where you’ll find more enormous lakes, the Wreck of the Peter Iredale and a bundle of civil war-era fortress attractions. 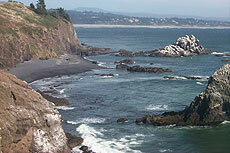 The south jetty is a spectacular beach spot and viewpoint. Soft, sandy beaches continue down for 15 miles or so. Seaside, Oregon and its upscale little brother Gearhart are comprised of mostly soft, sandy beach spots. 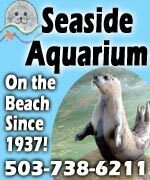 Take the Seaside, Oregon Virtual Tour or the Complete Guide to Seaside for a complete list of all beach accesses there. 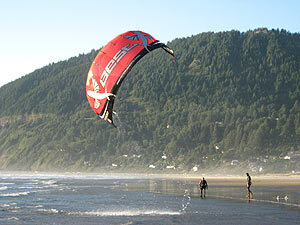 Cannon Beach comes up next, where Haystack Rock and miles of pristine beaches lay. 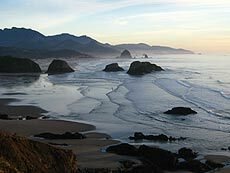 The northern end features landmarks like Ecola State Park, a heap of hiking trails and the surfing hotspot of Indian Beach. South of town, the beaches meander beneath high cliffs, the rocks-meets-sand beaches of Arch Cape, and major hiking drama around Cape Falcon. There’s more at the Cannon Beach Virtual Tour and the Cannon Beach, Oregon Complete Guide, which lists all beach access. The Manzanita area begins with Neahkahnie Mountain, its stunning overlooks and miles of trails to the top of the mountain. The sandy stretch of Manzanita gives way to the Nehalem Bay and all its outdoor activities, such as clamming, fishing, boating and more. 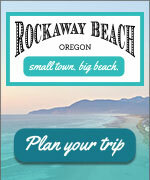 Then Rockaway Beach continues southward with seven more miles of strand. 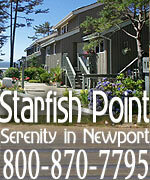 There’s more at the Nehalem Bay Virtual tour. 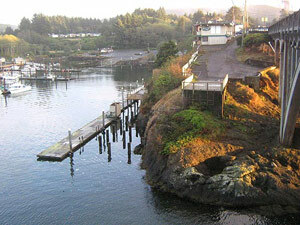 Barview begins the next stretch, the northern part of Tillamook Bay. 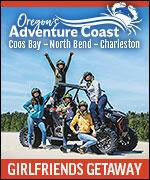 There, Garibaldi, Bay City, Tillamook and Bay Ocean provide all sorts of boat ramps, fishing guide tours and more. 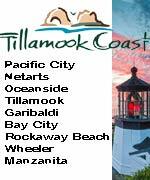 See the Tillamook Bay Virtual Tour. 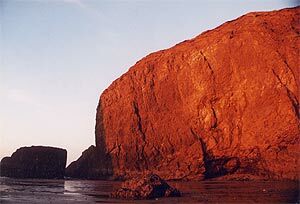 The Three Capes Loop is 25 miles of amazing, often clandestine beaches and cliff viewpoints. 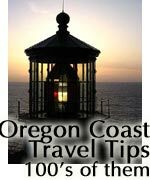 There, Cape Meares, Oceanside, Netarts, Cape Lookout, Tierra Del Mar, Pacific City and Cape Kiwanda create a great variety of things to do. Miles and miles of hiking trails snake throughout the area. 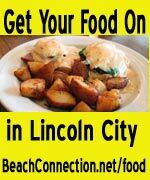 There is the Three Capes Virtual Tour that tells more, as well as the Three Capes Complete Guide, which outlines every beach access. 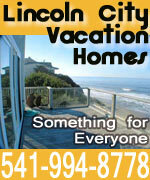 Just south of there, you get to the stunning and secretive beaches of Neskowin, and 15-minute drive from there will get you into Lincoln City. The town is about ten miles of meandering, beachy fun, which includes a glorious bay and a huge array of beachcombing possibilities. 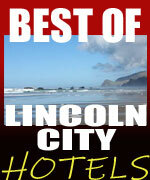 See the Lincoln City Virtual Tour or the Lincoln City, Oregon Complete Guide. Depoe Bay is the next little town, although there’s plenty to do along the stretches of sand at Gleneden Beach and Lincoln Beach, where it suddenly turns into the rocky cliff areas that the little town is known for. The bay here is chock full of fishing and whale watch guide boats. 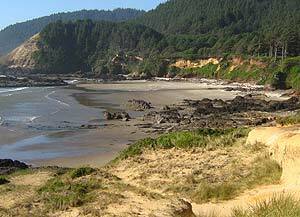 Just south of town are many high vantage points, like Cape Foulweather, with a mix of rocky platforms and low beaches. 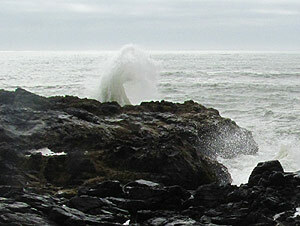 See the Depoe Bay Virtual Tour. Newport features miles and miles of beaches again, many of them surfing hotspots. Yaquina Head is huge for hiking. Fishing, clamming and other activities are big at Yaquina Bay, and then the area becomes the sandy stretch known as South Beach. 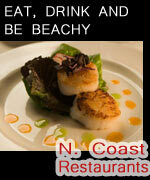 See the Newport Virtual Tour. 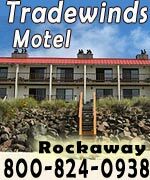 Waldport and Seal Rock are just south of town, with more of a mix of stunning rock climbing possibilities and long walks on the beach. This is where the Oregon coast starts to get filled with secret spots. 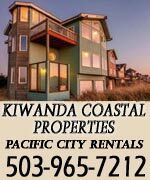 The Waldport – Seal Rock Virtual Tour and the Waldport – Seal Rock Complete Guide will show you more, including all beach access. At Yachats, the landscape turns from sand to surfaces made of rocky basalt, and these massive, craggy structures dominate. 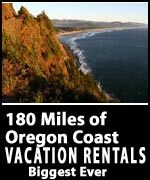 There’s the 804 Trail here – which is handicap accessible – and other hidden beaches, towering viewpoints and long walk possibilities like Cape Perpetua, the Devil’s Churn and a stellar chunk of the Oregon Coast Trail. 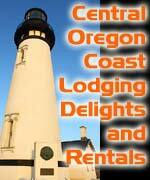 See the Yachats Virtual Tour for details. 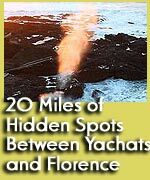 Between here and Florence sits 25 miles of unforgettable beaches, hiking trails and natural wonders. 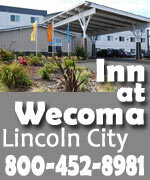 See the Upper Lane County Virtual Tour for details and photographs. Then to Florence, where the river that heads to the sea is the center of life, and surfing, sandboarding, boating and hiking happen along miles and miles of trails, lakes and huge sand dunes. 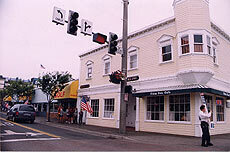 See the Florence, Oregon Virtual Tour. 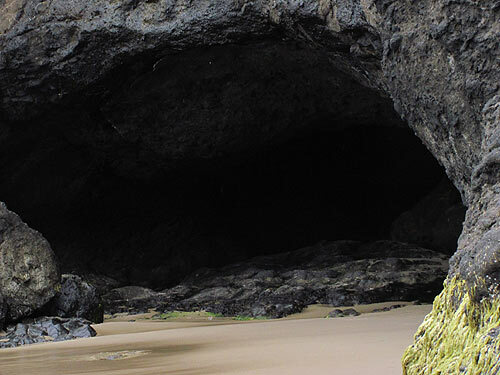 Below: a cave near Florence, just beneath the Heceta Head Lighthouse.